Magical moments happen when you dance under one of our dance floor canopies. Canopies unite many elements of classic décor such as columns, soft fabrics, lighting and other sculptures to create a total room décor. That’s the feeling you can get when we design sparkling dance floor decor for your event. Add twinkling lights for a starry, celestial-like setting that’s sure to Twinkling lights illuminate your room and create a glowing atmosphere unlike any other décor. Either fabric or balloons, or a combination of both, our dance floors help create a magical, fun, exciting mood for dances of all types. Dance floor designs come in a wide variety of shapes, sizes and colors, from simple to grand. 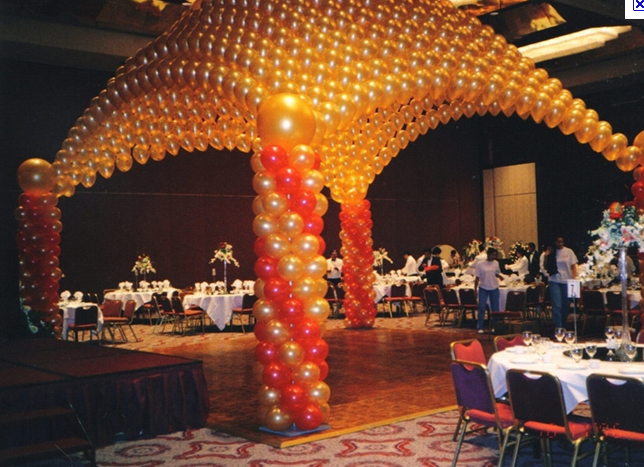 They are a great investment for events because they create excitement and become the center of attention. The photos show a small sample of dance floor canopies we have created. Simply ask us to create the perfect canopy so you and your guests will happily dance the night away. Sculpted balloon columns, softly draped tulle, twinkle lights and a sculpted heart come together to create romantic dance floor decorations, perfect for a wedding, anniversary or quinceanera. Criss Cross arches, Full Dome.